Isabella Tree describes Seychelles as a "mythical paradise," saying, "I've never seen so many extraordinary beaches and so few people on them. The forests are lush, the beaches are loaded with green and hawksbill turtles, and the water is crowded with fish." A native of England, Tree travels often and has written a new book, Sliced Iguana – Travels in Unknown Mexico, an engaging collection of stories about her journeys through hidden corners of Mexico (including Janitzio Island, which she covered on an ISLANDS assignment). The book has just been released by Hamish Hamilton (Penguin Books). Florida-based photographer Darrell Jones, who has been traveling for more than 30 years and has visited all seven continents, says Seychelles is truly the most beautiful place in the world. "It's remarkable; I absolutely have to go back," he says. His favorite moment? When he saw a small shark chasing a bonefish in a breaking wave on Alphonse. That's fitting for a man who got his start as a surf photographer. Jones has been shooting for ISLANDS for 17 years. On The Nature Trail For hiking, Jones recommends Silhouette Island. ("It's rugged with no roads but plenty of trails through thick vegetation.") For spectacular fly-fishing, he suggests walking the bonefish flats near Alphonse. ("You can catch 50 fish a day there.") The highlight of Praslin is the coco-de- mer at Vallée de Mai. And Bird Island was "teeming with birds," says Tree, "including hundreds of thousands of noisy sooty terns." Dive In Alphonse offers some of the best diving anywhere. ("The clarity," says Jones, "was remarkable, with 200-foot-plus visibility.") Desroches also has lovely coral, and Tree reports that the sea around the granitic islands, like La Digue, is alive with colorful fish, turtles, and lobsters. November/December and March/April are the best times to dive in the Amirantes; on Mahé, Praslin, Frigate, and La Digue the best times are from March through May and from September through November. Room Key Tree describes the resort on Frigate as "paradise on a silver platter"; Jones agrees. ("It's private and romantic; the lower deck has a Jacuzzi and outdoor bed under a canopy, the sleeping quarters are across the veranda from the sitting room, and the open bathroom has a hot tub and outdoor shower in the garden," he says.) The price for such luxury: ,600 per night for a villa for two, including all meals. 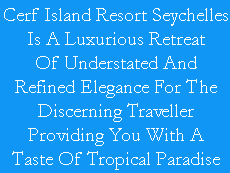 It's the only lodging on Frigate; Bird, Desroches, Alphonse, and Silhouette also have but one place to stay. Mahé, however, is crowded with resorts, while Praslin and La Digue have more affordable accommodations. Tree also loved the lodge at Bird Island. ("Surrounded by the sea, birds, fish, and turtles, you become completely attuned to nature," she says.) The price is 0 per night for a two-person bungalow, including all meals and the flights to and from Mahé. What's to Eat Seychelles cuisine features coriander, ginger, chilies, lemongrass, pepper, and fresh herbs. To savor local food, check out the produce and fresh fish at Sir Selwyn Clarke Market in Victoria, on Mahé. Then have lunch at L'Enforcement, the restaurant at the Jardin du Roi, an old spice plantation in the hills of Anse Royale. Tree recommends the tamarind chutney, spicy shredded green-papaya salad, and coconut fish curry. For dinner, she enjoyed the seafood at La Scala, also on Mahé, and the Creole cuisine prepared by locals on Bird Island. On La Digue, Choppy's serves a good grilled-fish lunch. Getting Around You can take a small plane, helicopter, or ferry between most major islands. (Fri-gate is reached either by the hotel's boat or helicopter.) Flights are short, but you'll have to return to Mahé before going on to another island. Tree recommends ocean crossings if the seas aren't too rough. ("You get a better sense of distance, and you have the chance to see marlin, dolphins, and whale sharks," she says.) You'll probably want to rent a car to get around Mahé and Praslin (about per day; drive on the left). For Desroches and Alphonse, bikes are the mode of transport; on Frigate, golf carts; on Bird, you travel on foot. Read it and leap For a history of the islands, try Seychelles Since 1770: History of a Slave and Post-Slavery Society by Deryck Scarr (1999). For an adventure story, read Beyond the Reefs, William Travis's account of shell-hunting and shark-fishing in Seychelles. The most useful guidebooks are Lonely Planet's Mauritius, Réunion & Seychelles and the Insight Pocket Guide to the Seychelles. Divers should take a look at Lonely Planet's Diving and Snorkeling the Seychelles (1997). The Indian Ocean Reef Guide, by Helmut Debelius, features more than 1,200 photos of marine species in their habitat. Cash Flow All major hotels and restaurants accept credit cards, and many accept U.S. dollars, so you won't need to change a lot of money. You'll find ATMs (that work intermittently) on Mahé, Praslin, and La Digue. You can change money at the airport or at banks on Mahé, Praslin, and La Digue, but save your transaction slips to convert your rupees back into dollars upon departure. 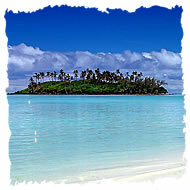 Travel Tips Tree recommends visiting for a minimum of two weeks and picking just three or four islands. Travel light; there are weight restrictions on small interisland flights, and airlines impose a surcharge if you have more than two pieces of luggage when you leave the country. International phone calls are expensive, so bring a phone card. Also bring along books and film for your camera, because there are no good bookshops, and film for slides is hard to find.